Global climate change is one of the most pressing issues facing our world today. The impact of increasing temperatures can be felt in diverse areas, including human health and disease, natural ecosystems, and food security. 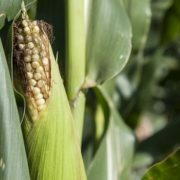 In the agricultural sector, deciphering how plants respond to changing environmental conditions (e.g., heat stress) is key to eventually boosting crop resilience and productivity. Previous research has shown that heat stress influences several important traits in plants, one of which is lipid balance and homeostasis (Higashi et al., 2015). 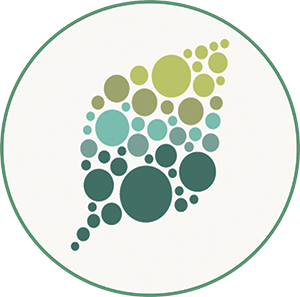 Specifically, heat decreases the abundance of chloroplast glycerolipids with polyunsaturated acyl groups, like monogalactosyldiacylglycerol (MGDG) and digalactosyldiacylglycerol (DGDG). Consequently, genes associated with lipid turnover are also differentially regulated by high temperature. 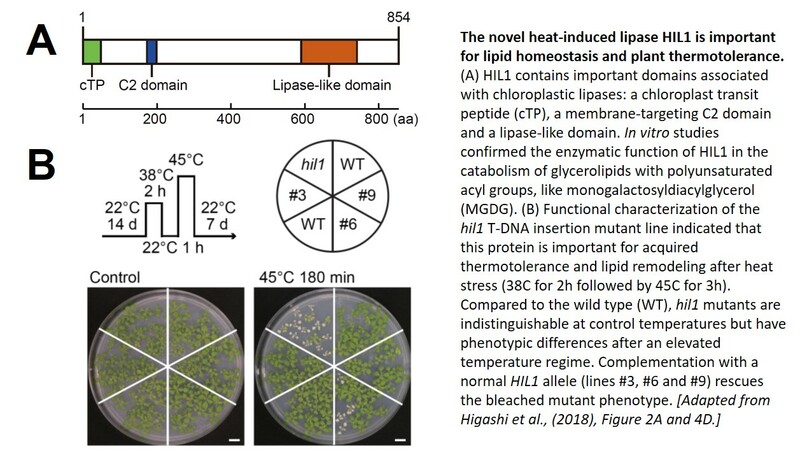 In this follow-up study by the same group, Higashi and colleagues (2018) describe a possible mechanism by which Arabidopsis thaliana plants readjust lipid composition in the chloroplast after heat stress. Because lipid turnover is regulated by an elevated temperature regime, they hypothesized that a heat-induced lipase must be responsible for this dramatic lipidome remodeling. Cluster analysis of the global transcriptome after heat induction revealed a candidate heat-induced chloroplast lipase gene called HIL1 (At4g13550). Sequence analysis showed that HIL1 is an 854-aa protein with a lipase-like domain, a membrane-targeting C2 domain, and a chloroplast transit peptide (cTP) at its N-terminal end, suggesting chloroplast localization (see Figure). 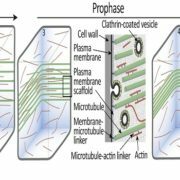 Subcellular localization analysis using fluorescence microscopy demonstrated that this protein is indeed targeted to the chloroplast. 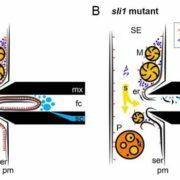 With a promising candidate gene in hand, the authors proceeded with functional analysis. 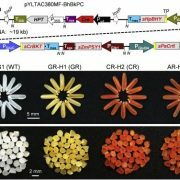 Consistent with the protein’s role in heat stress, the hil1 T-DNA insertion mutant line showed significantly lower thermotolerance—the mutant appeared bleached and had reduced survival rates following exposure to heat stress. These phenotypes were reversed when the wild-type HIL1 sequence was reintroduced into the mutant, confirming the role of HIL1 during high temperature stress. Importantly, Arabidopsis HIL1 had numerous homologs in other land plant species, suggesting that the HIL1-directed plant response to heat stress may be conserved in a broad range of plants. Delving deeper into the mechanism of HIL1 function, the authors conducted a lipidomic analysis of the hil1 mutant and revealed global perturbations in lipid composition. Particularly, this mutant had lower rates of MGDG catabolism during heat stress compared to wild-type plants. Consistent with this observation, the hil1 mutant also had reduced accumulation of heat-upregulated triacylglycerols. In vitro enzymatic studies confirmed that HIL1 is a lipase that can lyse a broad range of substrates, with a preference for heat-catabolized MGDG. This study by Higashi et al. (2018) is a comprehensive characterization of HIL1, from novel gene discovery to phenotypic characterization and eventual mechanistic investigation. Still, remaining questions abound. 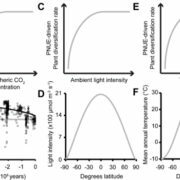 How does differential lipid remodeling in the chloroplast eventually lead to increased or decreased thermotolerance in plants? 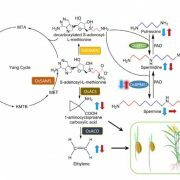 Does MGDG catabolism contribute specifically to resilience against temperature stress? 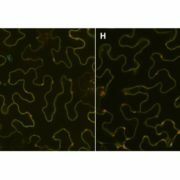 How rapidly do these plant lipidome changes return to normal? What thermosensory factors and mechanisms regulate HIL1 expression levels and HIL1 activity? 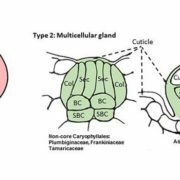 The answers to these questions would lead to a better understanding of plant responses to abiotic stresses, which could be harnessed for engineering more robust crops in the face of climate change. Higashi Y, Okazaki Y, Myouga F, Shinozaki K, Saito K (2015). Landscape of the lipidome and transcriptome under heat stress in Arabidopsis thaliana. Sci Rep 5: 10533. DOI: 10.1038/srep10533. Higashi Y, Okazaki Y, Takano K, Myouga F, Shinozaki K, Knoch E, Fukushima A, Saito K (2018). A lipase gene, HEAT INDUCIBLE LIPASE1, is involved in remodeling chloroplastic monogalactosyldiacylglycerol by liberating α-linolenic acid in Arabidopsis leaves under heat stress. Plant Cell pii: tpc.00347.2018. DOI: 10.1105/tpc.18.00347.